Onboarding training with a learning management system is a key part of welcoming in new employees. But is your onboarding training process protected against unforeseen circumstances? If you’re relying on managers or trainers to ensure onboarding training gets done then what do you do when the unexpected happens? If they’re out of the office due to illness or holidays your new hire is left to their own devices with no direction on what they need to do. Creating a reliable onboarding training process for new hires avoids this. In this post, we’ll show you exactly how you can build a reliable training process to successfully onboard new employees. As mentioned in a previous post, the onboarding training process is integral to getting a new hire up and running, This covers many different areas from systems to processes, to culture and socialization. Every new employee feels a certain amount of uncertainty stepping into a new role. And that’s natural. Reducing this uncertain feeling as early as possible makes it easier for them to start contributing. With all the effort that you put into finding the right talent, you’ll want to ensure their introduction to the company is a positive and welcoming experience. After all, orientation and onboarding affect the longevity of their time working within your organization. Your focus on training is also being placed under the microscope too. A proactive approach to training in the early stages emphasizes the role it has to play in the company culture. First things first, it’s week 1. How will your new hire gain access to their training? How are employees going to access the LMS? There are lots of ways to give someone access to your LMS. You can manually add them by creating a profile. You can invite them via email. Or you can set them up automatically. The latter being the most reliable! What if all the LMS admins are away at a conference, sick or on holidays Plan for these situations by automating access to your LMS. Connecting these two systems means that when the employee's record is created in the HR system it automatically triggers the creation of their profile in the LMS. Simple. This way, no one will forget to grant them access to the LMS! And they won’t have to wait to begin their training. The HR system and the LMS will synchronize too so that records are kept up to date. Let’s use an analogy to explain SSO. The new hire is given a ticket to an amusement park. When they walk through the main gate a wristband is placed on their arm. This allows them to enter into all of the rides or amusements in the park. They can leave and get back in again to any of the rides or amusements with the wristband. In this analogy, the LMS is one of the amusements in the park. It sits alongside all the other systems the employee needs to have access to. The wristband, the master credential, gives them access to other systems. It’s convenient for them, no need for an individual wristband otherwise known as their username and password to access each system. And it’s intuitive because access is gained by clicking a button. This button can be placed in your HR system, on an intranet dashboard, or if your organization uses Google apps, it’s featured in your list of connected apps. All you need to do is point the new employee in the right direction and they’re in. The first time they click the button their profile is created! How are employees enrolled in onboarding training? Don’t leave the enrolment process for onboarding to chance. Automate the process in advance of the new employee starting This way you’ll never have a situation where a new hire has access to the LMS, but no courses to take! All employees have to complete some common training courses, such as health and safety. 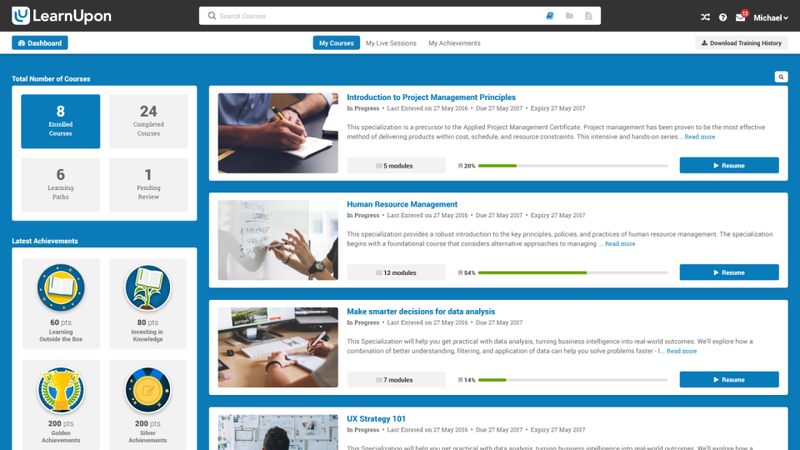 You can set the LMS up so that all employees get placed in a “compulsory training group” so they can find those courses they need to complete on their learner dashboard. What about role specific courses? The process is the same. Use the group functionality to enroll employees in specific courses by team or department. The best example of this is to create a “New Hires” group. Enroll this group in courses that every new hire needs to take during their onboarding period. They'll receive notifications to take the courses and reminders to complete their training which is super useful, the first few weeks in a new job can be busy. How to identify poor progress? In large organizations, there’s a lot of people to manage. You may not be in direct contact with each new hire but as the person ensuring training is done you'll want to track everyone's progress. You can do this easily by filtering reports to see how new hires are doing. You’ll see straight away if some have not launched their courses or haven’t made much progress. A quick reminder to their line manager or directly to them can get them back on track with their onboarding training. A great way to save time is to set up a scheduled report that you receive every week. It can also be automatically sent to the new hires line manager or head of a department. At a glance, you can check in on how new hires are progressing with their training. Managers love the ability to have this information to hand so that they can identify potential issues before being blindsided by them. Automating this makes your process even more resilient against disruption. A little effort at the start can reap rewards in the future. Thinking about how you want your training to run can result in an automated, resilient and time-saving onboarding process for new hires. This helps you keep talented employees engaged and supports them in getting to a point where they can shine within their new role. Train your new employees with LearnUpon. The powerful learning management system that has the features and a knowledgeable team you need to achieve training success.